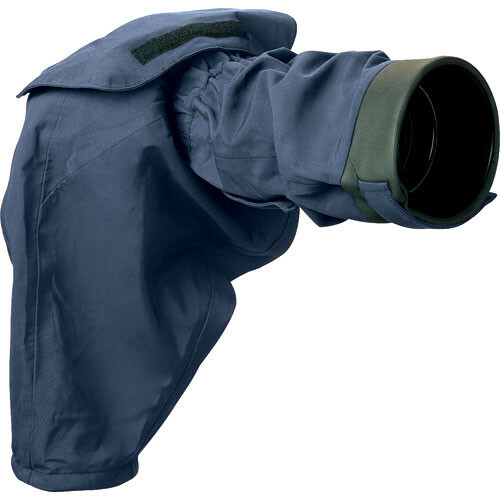 The navy SS-200 Sport Shield Rain Cover from Aqua Tech is primarily designed to fit Nikon or Canon digital or film SLR cameras, with lenses up to 10 x 5.0" attached. It is made of high-quality, 3-ply, waterproof, breathable fabric, fully tape seam sealed with waterproof silicone sealing around the view windows. It is made with YKK weatherproof zippers for ease of application and removal. The rain cover provides a watertight seal around lens front. The one-piece design provides complete enclosure and moisture protection for both the camera body and lens with a "glove-like" fit. It is designed with a waterproof sleeve to access and operate the camera controls safely and easily. There are draw strings on hand access and tripod sleeve for protection when not in use. It has waterproof view windows to monitor camera functions. The eyepiece cover flap protects the viewfinder when not in use. Note: Requires an eyepiece to hold cover to camera and maintain waterproofing. Requires an eyepiece to hold cover to camera and maintain waterproofing. It provides a watertight seal around lens front. One-piece design provides complete enclosure and moisture protection for both camera body and lens with a "glove-like" fit. Waterproof view windows to monitor camera functions. Designed with a waterproof sleeve to safely and easily access and operate camera controls. Draw strings on hand access and tripod sleeve for protection when not in use. The cover is quickly and easily applied and removed. Eyepiece cover flap to protect viewfinder when not in use. SS-200 Sport Shield Rain Cover (Navy) is rated 4.2 out of 5 by 24. Rated 3 out of 5 by Dane from Great for use with a prime The cover is of very high quality and would work well with a prime lens in autofocus mode. My big problem is that there is almost no access to the lens with the cover intalled. No zooming and no manual focusing. AquaTech's website lists this cover fitting both the 100-400L and the 24-105L (among many others). The elastic band of the cover falls right on top of the zoom ring of the 24-105 making it very difficult to use. And, while the 100-400 does fit inside the cover, it only does so when retracted to the 100 length. I had very high hopes for this cover and the quality is great but it just does not work with my bag of zoom lenses. Rated 3 out of 5 by Rockskipper from Good protection, but challenging to use I already own a solid blue SS-200 sports shield, and have been very happy with it. However, in the 5 months between ordering my original shield and this, camo-colored shield, the design changed, and for my use, not for the better for the following reasons: 1) it is very difficult to work a zoom though this cover 2) the neoprene eyepiece hole doesn't fit easily over the required adapters 3) if you need to change lenses, you must completely remove the cover. My previous SS-200 has a full-length zipper along the bottom side of the lens which made it much easier to use. I do like the level of protection that the Aqua Tech sports shields provide over cheaper vinyl and velcro alternatives. But they are pricey! Rated 4 out of 5 by DucDuc from Must have for out doors Construction is top notch. If you need to keep it dry this the kit you need, should work at the beach or in the desert against dust just as well. I used mine in very heavy rains and wind and can not see any other product that would tolerate the weather I exposed it too and stow so easily and compact. I'm not overly impressed with the eye piece and the window is too low for my 7d so I can not see the shutter speed and other top line info on the screen. Not a big deal as it's available info in the view finder, just say'n. This why I give it a four not a five, notwithstanding the aforementioned I can not image a better built product is out there for this purpose. Rated 5 out of 5 by Anonymous from Must have for shooting on the water This is the second SS-200 I have bought and in a year the improvement has been amazing. The main complaints I had about my first one (bought in Dec. 2009) were about the neoprene thing around the eye piece. The new SS-200 has a much more durable seeming collar. The only thing I would ask for now is a little finger pocket in the middle of the lens holder to allow for easy manipulation of zoom lenses that use a ring to zoom as opposed to trombone style zoom. For instance the difference between the canon lenses 70-200 2.8 and 100-400 f4-5.6. Rated 5 out of 5 by Anonymous from Waterproof Cover - GREAT I had to shoot 4 football games in the rain and it was cold. I was soaked and frozen but my camera was not. This cover worked like a charm. Not only did it protect the camera from the rain, it served as a wind barrier from the cold on my hand. The only thing I can say in a con would be that the plastic fogs up at times. No big deal, just wipe it off and there is no way to use your camera strap. I still give it 5 stars. Don't forget the eye piece for this, you need it to keep the cover in place. The eye piece is very comfortable too. Thinking about adding this eyepiece to all my cameras. Rated 4 out of 5 by FlightDeck from Survived Antarctica! INTRO I purchased this cover (plus eye piece and lens cap) for a trip to Antarctica in Nov-Dec 2008, for sea-spray in the zodiac boats and shooting in snow/rain. It all worked as advertised! :) Even in steady freezing rain for over an hour it kept the camera protected and functioning (a Canon 50D, Canon 70-200 f/4 IS lens, and Canon 1.4x extender, all having some built-in environmental seals). QUALITY The material feels very durable, like a well-made softshell rain coat, and is well tailored to its purpose. You quickly see where it fits relative to other products on the market. INSTALLATION Installing/removing the cover becomes relatively easy, with a neckstrap being the most finicky part. I generally left my cover on the camera for the entire trip. The custom eyepiece fits very tightly, requiring some force to push on. FEATURES and USAGE The access areas to allow a tripod, an external flash, and a neckstrap are well thought-out (caveat: I used only the latter). The lens cap (sold separately) is very easy to put on, to protect your lens from spray when not shooting. Camera controls have good accessibility even though it's quite snug under the cover. It's right-hand access only. Your left hand will be holding the lens outside the cover. Unzip the tripod mount area under the lens to access lens switches (AF/MF, IS, etc.) ---some of the farther switches may be tricky to see. Depending on the weather conditions, you could leave this zipper open all the time to control lens zoom or focus directly. This may be difficult if wearing gloves. I often wore no glove on my right hand as the cover itself was enough protection from the wind and cold. In colder conditions, a light glove with good tactile dexterity on the fingertips worked well inside the cover. The cover has good room for a battery grip or a full-size camera body. All of the Canon 50D's LCD displays and most controls were visible through the 3 clear plastic windows (2 on top, one on back). The Menu button was both tricky to see and reach at the upper-left side of the camera's rear LCD screen, however by moving the cover slightly you can still see/operate it. Hidden at the upper-right of the camera back are the AE Lock button, AF Point Selection button, and the 8-way control switch, and I sometimes inadvertently hit the latter two under the cover. This is to be expected with any cover, so just be vigilant with your settings. I noticed no view degradation through the custom eyepiece compared with the Canon eyepiece. Velcro flaps cover the various windows and potential leak areas. When shooting, the top windows are covered by flaps, which must be lifted to see camera settings. When doing this frequently, I wished the velcro was maybe a little less strong. In weather conditions where you don't need the added protection of the flaps, I discovered (after my trip) a way to roll the flaps up so that all windows are uncovered simultaneously. 1. Start with the top flap and rear flaps separated. 2. Fold the top flap's side wings, which cover the camera strap holes, inward on top of the flap. 3. Fold the top flap in half towards the back of the camera. 4. Roll the rear flap up tightly towards the top of the camera. 5. Connect the long velcro strip on the top flap to the short velcro strip on the right underside of the rear flap. Done. (Note this won't work if you have items stored inside the rear flap pocket). As the customization of the cover to the specific lens size range is excellent, you will need to buy the appropriate cover(s) if you want to use multiple lenses. I tried using this cover with my Canon 17-40 f/4 lens without success. When weather conditions didn't require the cover, I simply unzipped the forward portion and rolled it up around the body, leaving it attached to the camera, to permit use of the 17-40 lens. Changing covers would not be fast with camera straps involved, so if you require fast changes between lens ranges *and* you need weather protection, then having two bodies with their own lenses and covers is perhaps the only way. For more casual shooters, I recommend simply going out with the lens/cover combination you are most likely to need on that particular wet day, and don't bother with lens sizes not intended for that cover. PERFORMANCE The camera gear kept working flawlessly in some fairly cold and damp conditions. The cover got wet inside on two occasions, and I completely removed it afterwards to dry everything out (it dries quickly!). I don't know if it was due to a leak, or if the material simply becomes saturated after extended wet usage/handling. Note my waterproof parka faired no better :) I think some dampness occurs due to condensation of moisture evaporating from my hand, as the clear plastic windows would sometimes fog up on the inside surface. The military photographers where I work said they sometimes put hand-warmer pads inside their covers for warmth (wasn't needed in my case), and I wonder if this might help control the condensation inside the cover. Operation of all shooting controls was trouble-free, and I never missed a shot due to the cover (something I can't say for other home-made solutions I've tried!). Zoom control requires twisting on the cover to get the lens to rotate, and there is a bit of a slipping/ratchet effect. After practice I could readily get to either end of the zoom range, even if fine adjustments were a little tricky. The cover did not cause the zoom or focus to drift. You could also try adjusting the lens directly by unzipping the tripod mount area under the lens, if weather conditions permit. The grip of the neoprene cover around the lens hood is excellent, and never came loose despite lots of jostling around backpack straps, life preserver collar, other camera straps, bulky parka, crawling in the snow, etc. In fact, the grip is so good that sometimes the twisting of the cover to adjust lens zoom rotates the lens hood in its bayonet-style mount---once, it rotated far enough that it popped loose (easily put back on). My primary concern before the trip, and one about which I wrote to Aqua Tech before purchasing, was the durability of the clear plastic windows in cold. I had read another review that mentioned one shattering in the cold. I'm happy to say this did not happen, and the windows remained flexible in temperatures down to the Antarctic peninsula's springtime range of -5'C. Having said that, -5'C is not very cold for some places, and having just returned to Canada for the winter, I don't yet have results for say -15 to -25'C. At those temperatures there's obviously no rain(!) nor even much snow, and a cover is probably not needed---blowing snow would be the main concern. (Aqua Tech has advised that they are doing some development testing at lower temperatures to see how things perform.) An unexpected and very pleasant side effect of using the cover is that it muffles the camera's sound a bit, plus the cover itself is soft and does not make rustling noises. Immediately after leaving Antarctica I shot in Mexico for a week without the cover, and it was startling how much louder the camera seemed. Shooters of skittish wildlife will definitely appreciate this added bonus of noise reduction, and it may be possible to stuff other sound insulation inside the cover. CONCLUSION The cover worked very well, kept my equipment functioning through snow, rain, freezing rain, sea spray, and even drenching by waves that came over the zodiac's bow. My camera was always at the ready, and the presence of the cover never interfered with my getting a shot---more importantly, it let me get shots in conditions where the camera would otherwise be stowed in a waterproof bag. With this cover, I found shooting in the relatively harsh and unpredictable Antarctic environment quite enjoyable, which is much more than I can say for a miserable day I had shooting motorcycle races in the pouring rain last summer *without* a cover. I can't wait to try this cover at the next rainy race! I highly recommend these products. Both passengers and expedition staff on the Antarctic trip asked me about the cover daily, how it worked, where to get them, etc. I quickly became recognizable among the group due to the navy blue cover around my camera. Just think how popular I'd be if I had the camouflaged version! ;) This cover shows great attention to design detail and high quality of construction. I rate it overall 4 out of 5, as there were cases of wetness inside the cover and I think there is always room for little improvements. Score aside, I think this may be the best overall rain cover on the market today. Rated 4 out of 5 by Anonymous from Great Quality As a rain cover the quality is very impressive. It seals very well around the lens. I use it on my Canon 70-200 f2.8 IS lens. The cover is best when used with a tripod or monopod as the cover does not lend itself to using the shoulder straps on the camera. Additionally, if using with a zoom lens you will have some difficulty in adjusting your zoom. Rated 4 out of 5 by nikon.d1s from Worth every penny!!!! I am a sports photographer and have used this cover in heavy downpours without any problems. The only reason I did not give it a 5 star rating was due to the introduction of condensation inside the cover. I do realize that this may be an unavoidable issue, but it is something that I have experienced with EVERY cover I have used and would love to see it no longer be an issue.